iOS devices usually receive update over the iOS update option. These OTA updates are rolled out on a periodic basis and when a new update is available, the users would be notified via the notification bar and they can later access the Settings app to conduct the update as well. However, if someone wishes update the device via iTunes – it could be done. Also, restoring the device via iTunes is sometimes necessary due to crucial software updates or for just resetting purposes. Whatever be the purpose, iTunes Error 4005 or iTunes Error 4013 / 4014 often shows up during these concerns that states that the Apple device can’t be restored. Your iPhone has 1GB or more space. You have the latest iTunes version. You have a original Apple certified USB cable. Restart iTunes – Even though this fix might seem very generic and maybe silly, but restarting iTunes when error 4005 occurs often works. 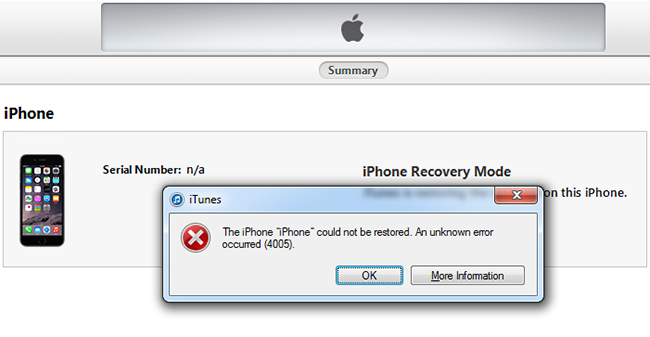 iTunes may suffer from registry and file management errors which is likely to be solved during the iTunes restart. Also, if there had been any problem with iTunes to register a device connected to the computer periphery, error 4005 could show up which would be solved by a restart of the iTunes program. Reboot Computer – If restarting iTunes hasn’t solved the issue, then the user may proceed with restarting the computer. Similar issues could hamper Apple device restore as mentioned in point #1. Restarting the computer cleans up the registry and resolves any issues with iTunes and device connectivity, also any other connectivity conflicts if there are any. Check after a restart whether iTunes is now capable of restoring your device. Update iTunes to the Latest Version – Older versions of iTunes are prone to conflict between hardware and software handling, hence a stable connection may not be formed resulting into Error 4005 where iTunes isn’t able of restoring Apple device via iTunes. Find the Update iTunes button on your iTunes program and upgrade to the latest version. Elsewise, a user might also try manual updating by downloading the executable installer. After iTunes has detect your iPhone, try to restore it again. Update Computer to Latest OS – A backdated operating system could pose trouble for the software frameworks to keep up. A latest iTunes software may just not be able to fit in with older software frameworks in an older version of operating system software. Also, there may not be support for certain operating systems, their specific versions or service packs. To solve all these issues, a computer should have the latest operating system. Try Other USB Port – If the software issues above doesn’t fix iTunes Error 4005, there may be issues with the cable or the USB port on your computer. Try trial-and-error methods for assessing the cables you have and the USB ports on your computer. Also, few computers have issues with USB port voltage output. Check all these if the error keeps showing up. Replace your Battery – In some cases, replacing the battery can fix the iTunes error 4005. The main problem is because the battery have a low power. We recommend you to replace with a original battery. Replace the Dock connector – If you used some non-original chargers, your dock connector can be damaged and have a bad communication with the usb cable. By replacing the connector, the communication will be perfect and you will fix the error 4005. Make sure you are using a original certified cable when you restoring your device via iTunes. Restore Without a LCD – Disconnect the display from your device completely, connect to iTunes and try to restore it. If you have hardware problem in the display, this will bypass the problem. If you still get a Error 4005, then move to the next method. Replace Proximity Sensor Flex Cable – Try to replace the Replace Proximity Sensor flex to fix Error 4005. If you still get a error 4005, try to replace the front camera flex cable also. Remove compass IC – The compass chip can be the main problem you getting iTunes error 4005. Try to remove the Compass iC to get rid of this issue. We must to note that you need to have a technical skills to do this method. Conclusion: Usually, these methods would totally heal the Error 4005 issue on iTunes. However, in case the problem still persists it’s suggested that the Apple device is taken to an Apple service center immediately. Don’t forget to share this article and post a comment below.